Alioramus (/ˌælioʊˈreɪməs/; meaning 'different branch') is a genus of tyrannosaurid theropod dinosaurs from the Late Cretaceous period of Asia. The type species, A. remotus, is known from a partial skull and three foot bones recovered from Mongolian sediments which were deposited in a humid floodplain about 70 million years ago. These remains were named and described by Soviet paleontologist Sergei Kurzanov in 1976. A second species, A. altai, known from a much more complete skeleton, was named and described by Stephen L. Brusatte and colleagues in 2009. Its relationships to other tyrannosaurid genera are unclear, with some evidence supporting a hypothesis that Alioramus is closely related to the contemporary species Tarbosaurus bataar. A possible third species, A. sinensis was described in 2014 on the basis of fossils found in the Nanxiong Formation of China. Alioramus were bipedal like all known theropods, and their sharp teeth indicate that they were carnivores. Known specimens were smaller than other tyrannosaurids like Tarbosaurus bataar and Tyrannosaurus rex, but their adult size is difficult to estimate since both Alioramus species are known only from juvenile or sub-adult remains. The recent discovery of Qianzhousaurus indicates that it belongs to a distinct branch of tyrannosaur. The genus Alioramus is characterized by a row of five bony crests along the top of the snout, a greater number of teeth than any other genus of tyrannosaurid, and a lower skull than most other tyrannosaurids. Alioramus remotus was estimated at 5 to 6 metres (16 to 20 ft) in length when originally described by Sergei Kurzanov in 1976. Kurzanov, however, did not correct for lengthening of the skull by deformation during fossilization, which may indicate a shorter overall body length for this individual. If this specimen is a juvenile, then adult Alioramus would have reached greater lengths, but no confirmed adult specimens are known. The skull of A. remotus was approximately 45 centimetres (18 in) long. In general, it is long and low, a shape typical of more basal tyrannosauroids and juveniles of larger tyrannosaurids. The premaxillary bones at the tip of the snout in Alioramus remotus have not been found, but are taller than wide in all tyrannosauroids for which they are known. The nasal bones are fused and ornamented with a row of five irregular bony crests that protrude upwards from the midline, where the nasal bones are sutured together. These crests all measure more than 1 centimetre (0.39 in) tall. At the back of the skull there is a protrusion, called the nuchal crest, arising from the fused parietal bones, a feature shared with all tyrannosaurids. In Alioramus, the nuchal crest is greatly thickened, similarly to Tarbosaurus and Tyrannosaurus. Like the rest of the skull, the lower jaw of Alioramus was long and slender, another possible juvenile characteristic. As in Tarbosaurus, a ridge on the outer surface of the angular bone of the lower jaw articulated with the rear of the dentary bone, locking the two bones together and removing much of the flexibility seen in other tyrannosaurids. Other tyrannosaurids had four premaxillary teeth, D-shaped in cross section, on each side. Including 16 or 17 in each maxilla, and 18 in each dentary, Alioramus had 76 or 78 teeth, more than any other tyrannosaurid. The braincase of A. altai was intermediate between the basal theropod and avialan conditions. The rest of the skeleton of Alioramus remotus is completely unknown except for three metatarsals (bones of the upper foot), but the discovery of A. altai, which is known from substantially more complete remains, has shed light on the anatomy of the genus. Paleontologists have long classified Alioramus within the superfamily Tyrannosauroidea, but because its remains were for many years poorly known, a more precise classification had remained elusive until the discovery of A. altai. A cladistic analysis published in 2003 found Alioramus could be further classified into the family Tyrannosauridae and the subfamily Tyrannosaurinae, alongside Tyrannosaurus, Tarbosaurus and Daspletosaurus. A 2004 study supported this result but suggested it was equally probable that Alioramus belonged outside the family Tyrannosauridae entirely, with its supposed juvenile characters actually reflecting a more basal position within Tyrannosauroidea. Another study omitted Alioramus altogether due to the only specimen's fragmentary nature. The discovery of A. altai in 2009 confirmed the placement of the genus within the Tyrannosaurinae. Tarbosaurus and Alioramus shared several skull features, including a locking mechanism in the lower jaw between the dentary and angular bones, and both lacked the prong of the nasal bones which connected to the lacrimal bones in all other tyrannosaurids except adult Daspletosaurus. The two genera may be closely related, representing an Asian branch of the Tyrannosauridae. Some specimens of Tarbosaurus have a row of bumps on the nasal bones like those of Alioramus, although much lower. 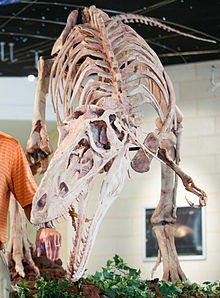 The long and low shape of the only known Alioramus remotus skull indicated that it was immature when it died and might even have been a juvenile Tarbosaurus, which lived in the same time and place. The more prominent nasal crests and much higher tooth count of Alioramus, however, suggested it was a separate taxon, even if it is known only from juvenile remains, confirmed by the discovery of A. altai. Specimens identified as immature Tarbosaurus have the same tooth count as adults. Recently a cladogram has been published finding Alioramus just outside Tyrannosauridae. Below is the cladogram by Loewen (2013). The holotype (PIN 3141/1) of Alioramus is a partial skull associated with three metatarsals. A joint Soviet-Mongolian expedition to the Gobi Desert in the early 1970s found these remains at a locality known as Nogon-Tsav in the Mongolian province of Bayankhongor. Alioramus was named and described by Russian paleontologist Sergei Kurzanov in 1976. Its crests and low skull profile looked so different from other tyrannosaurids that Kurzanov believed his find was far removed from other members of the family. Accordingly, he gave it the generic name Alioramus, derived from the Latin alius ('other') and ramus ('branch'), and the specific name A. remotus, which means 'removed' in Latin. Alioramus is known from the holotypes of A. remotus and A. altai. The Beds of Nogon-Tsav are considered to be the same age as the Nemegt Formation. This geologic formation has never been dated radiometrically, but the fauna present in the fossil record indicate it was probably deposited during the Maastrichtian stage, at the end of the Late Cretaceous. The Maastrichtian stage in Mongolia, as preserved in the Nemegt Formation and at Nogon-Tsav, was characterized by a wetter and more humid climate compared with the semi-arid environment preserved in the earlier, underlying Barun Goyot and Djadochta Formations. Nemegt sediments preserve floodplains, large river channels and soil deposits, but caliche deposits indicate periodic droughts. This environment supported a more diverse and generally larger dinosaur fauna than in earlier times. Kurzanov reported that other theropods, including Tarbosaurus, ornithomimosaurs and therizinosaurs were discovered at the same locality, but these remains have never been reported in detail. If the Nogon Tsav fauna was similar to that of the Nemegt Formation, troodontid theropods, as well as pachycephalosaurs, ankylosaurids and hadrosaurs would also have been present. Titanosaurian sauropods were also potential prey for predators in the Nemegt. ^ Carr, Thomas D.; Varricchio, David J.; Sedlmayr, Jayc C.; Roberts, Eric M.; Moore, Jason R. (2017). "A new tyrannosaur with evidence for anagenesis and crocodile-like facial sensory system". Scientific Reports. 7: 44942. doi:10.1038/srep44942. PMC 5372470. PMID 28358353. ^ Junchang Lü; Laiping Yi; Stephen L. Brusatte; Ling Yang; Hua Li; Liu Chen (7 May 2014). "A new clade of Asian Late Cretaceous long-snouted tyrannosaurids". Nature Communications. 5 (3788): 3788. doi:10.1038/ncomms4788. PMID 24807588. ^ a b c d e Kurzanov, Sergei M. "A new carnosaur from the Late Cretaceous of Nogon-Tsav, Mongolia". The Joint Soviet-Mongolian Paleontological Expedition Transactions (in Russian). 3: 93–104. ^ a b c d e f Holtz, Thomas R. (2004). "Tyrannosauroidea". In Weishampel, David B.; Dodson, Peter; Osmólska, Halszka (eds.). The Dinosauria (Second ed.). Berkeley: University of California Press. pp. 111–136. ISBN 978-0-520-24209-8. ^ a b c Hurum, Jørn H.; Sabath, Karol (2003). "Giant theropod dinosaurs from Asia and North America: Skulls of Tarbosaurus bataar and Tyrannosaurus rex compared". Acta Palaeontologica Polonica. 48 (2): 161–190. ^ a b Currie, Philip J. (2003). "Cranial anatomy of tyrannosaurids from the Late Cretaceous of Alberta". Acta Palaeontologica Polonica. 48 (2): 191–226. ^ "Variation, Variability, and the Origin of the Avian Endocranium: Insights from the Anatomy of Alioramus altai (Theropoda: Tyrannosauroidea)". PLOS Collections. doi:10.1371/journal.pone.0023393;jsessionid=B5ED8399160D7F46A7647ADE513F5B9C.ambra01 (inactive 2018-08-06). Retrieved 2012-11-09. ^ a b c d Brusatte, Stephen L.; Carr, Thomas D.; Erickson, Gregory M.; Bever, Gabe S.; Norell, Mark A. (2009). "A long-snouted, multihorned tyrannosaurid from the Late Cretaceous of Mongolia". Proceedings of the National Academy of Sciences of the United States of America. 106 (41): 17261–6. doi:10.1073/pnas.0906911106. PMC 2765207. PMID 19805035. ^ a b Currie, Philip J.; Hurum, Jørn H; Sabath, Karol (2003). "Skull structure and evolution in tyrannosaurid phylogeny". Acta Palaeontologica Polonica. 48 (2): 227–234. ^ Carr, Thomas D.; Williamson, Thomas E.; Schwimmer, David R. (2005). "A new genus and species of tyrannosauroid from the Late Cretaceous (middle Campanian) Demopolis Formation of Alabama". Journal of Vertebrate Paleontology. 25 (1): 119–143. doi:10.1671/0272-4634(2005)025[0119:ANGASO]2.0.CO;2. ^ Maleev, Evgeny A. (1955). "New carnivorous dinosaurs from the Upper Cretaceous of Mongolia". Doklady Akademii Nauk SSSR (in Russian). 104 (5): 779–783. ^ Currie, Philip J. (2003). "Allometric growth in tyrannosaurids (Dinosauria: Theropoda) from the Upper Cretaceous of North America and Asia". Canadian Journal of Earth Sciences. 40 (4): 651–665. doi:10.1139/e02-083. ^ Loewen, M.A. ; Irmis, R.B. ; Sertich, J.J.W. ; Currie, P. J.; Sampson, S. D. (2013). Evans, David C (ed.). "Tyrant Dinosaur Evolution Tracks the Rise and Fall of Late Cretaceous Oceans". PLoS ONE. 8 (11): e79420. doi:10.1371/journal.pone.0079420. PMC 3819173. PMID 24223179. ^ Osmólska, Halszka (1997). "Nemegt Formation". In Currie, Philip J.; Kevin Padian (eds.). The Encyclopedia of Dinosaurs. San Diego: Academic Press. pp. 471–472. ISBN 978-0-12-226810-6.